Yang Xiaodu takes the oath of office after being chosen as director of the National Supervisory Commission during a plenary session of China's National People's Congress (NPC) at the Great Hall of the People in Beijing (March 18, 2018). In one of the most controversial but overshadowed outcomes of its March 2018 meeting, China’s National People’s Congress (NPC) approved a constitutional amendment creating a super-sized anti-corruption body called the National Supervision Commission and adopted a Supervision Law to govern its operations. A massive institutional restructuring plan subsequently issued by the Chinese Communist Party (CCP) makes clear the Commission will be co-located with — and integrate its anti-corruption functions with — the CCP’s own powerful anti-graft body, the Central Commission for Discipline Inspection (CCDI). Chinese authorities intended the Supervision Law to place China’s ongoing anti-corruption campaign under legal procedures, rather than continuing to prosecute it primarily through the CCDI’s internal — and extralegal — channels. But the Law fails to subject anti-corruption work to the due process requirements of China’s criminal justice and administrative law systems. Instead, its stipulations appear to be enforceable only by the state supervisors it purports to regulate and by the CCDI. This arrangement makes the National Supervision Commission ultimately accountable only to the CCP, threatening both to undermine efforts to establish law-based governance and to complicate China’s global anti-corruption campaign. China’s leaders have long recognized corruption as the greatest threat to the CCP’s legitimacy and sustainability. After taking office as CCP general secretary in November 2012, Xi Jinping vowed to institutionalize the CCP’s ongoing anti-corruption efforts and called for strengthened laws to punish and prevent corruption. After five years of an anti-corruption campaign that investigated more than 2.7 million officials, punished more than 1.5 million, and criminally tried 58,000, Xi pressed for reform of the supervision system to more effectively constrain the power of public servants “in a cage of regulations” under CCP leadership. Before the Commission was created, anti-corruption work was nominally divided between the CCP and the state. On the CCP side, the CCDI enforced party discipline — including party loyalty, anti-graft, and ethical and lifestyle requirements — against Party members, who constitute 80 percent of civil servants and 95 percent of leading officials. The CCDI turned evidence of criminal wrongdoing over to the state for prosecution. On the state side, three agencies conducted anti-corruption work. The State Council Ministry of Supervision (MOS) supervised the minority of civil servants who were not CCP members, investigating graft, misappropriation of public funds, and other duty-related violations. The National Bureau of Corruption Prevention made anti-corruption policy recommendations and handled international anti-corruption coordination. Specialized departments of the Supreme People’s Procuratorate (SPP) were responsible for investigating various kinds of corruption, and malfeasance. The anti-corruption functions of the MOS, the corruption prevention bureau, and the SPP have now been transferred to the Commission. The National Supervision Commission leads local commissions at the provincial, city, and county levels. The Supervision Law describes these commissions as specialized organs for supervising all public personnel who exercise public power. Their authority is much broader than that of the former MOS, and they enjoy more investigatory powers, including the controversial power of detention. 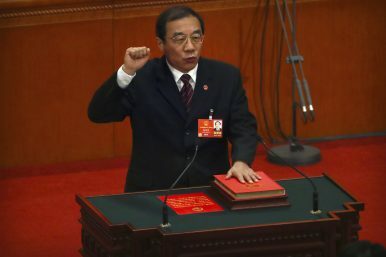 Whereas the MOS had jurisdiction only over non-CCP government employees, the Supervision Law gives the commissions authority over civil servants within a wide range of bodies: the CCP, the government, the people’s congresses, the supervision commissions themselves, the people’s courts and procuratorates, the people’s political consultative congresses, the eight democratic parties, federations of industry and commerce, and other personnel managed “with reference” to China’s Civil Servants Law or who work in organizations that manage public affairs. The supervision commissions’ writ further extends to managerial personnel of state-owned enterprises; state educational, scientific research, cultural, health care, sports, and similar entities; and villager and urban residents committees at the grassroots level. Finally, their authority covers “other personnel who perform public duties.” They explicitly do not, however, have jurisdiction over personnel from the People’s Liberation Army and People’s Armed Police, who are instead supervised by the CCP-led Central Military Commission. Nonetheless, the Supervision Law doubles and even triples in some regions the number of personnel subject to supervision. China’s amended constitution establishes the National Supervision Commission as a fourth branch of government. It is nominally co-equal with the State Council, Supreme People’s Court (SPC), and SPP (although it is listed after the State Council and before the SPC and SPP in various constitutional clauses). The National Supervision Commission’s director is “elected” by, and reports to, the NPC — the highest organ of state power under the Constitution. However, since the Commission has the authority to supervise the NPC, as well as the State Council, SPC, and SPP, its de facto status appears to be above those institutions. The constitution and the Supervision Law are silent on the Commission’s relationship with the CCDI. The new law establishes the CCP’s leadership over state supervision work, even while the supervision commissions are in turn tasked with supervising CCP members who are civil servants. However, it is the CCP’s restructuring plan, not the Supervision Law, that makes clear the discipline inspection and supervision organs are to be co-located and “integrate” the enforcement of party discipline and state supervision. They will “operate as one set of working institutions with two differently named organs,” an arrangement that had previously described the MOS, which similarly shared offices, organizational structure, personnel, and a website with the CCDI. Politburo Standing Committee member Zhao Leji currently heads the CCDI, whereas Politburo member and Deputy CCDI Director Yang Xiaodu heads the National Supervision Commission. The differently ranked institutional heads indicates the CCDI is politically superior to the Commission. Reporting requirements also denote the CCDI’s dominance. Under the Supervision Law, the Commission is responsible to the NPC, while local supervision commissions are responsible to the people’s congresses at the same level and to the supervision commissions at the next-higher level. The Supervision Law fails to mention that local supervision commissions are subject to additional oversight by the CCP committee at the same level and the disciplinary inspection commission at the next-higher level. This extralegal subordination to the CCP and its discipline inspection system exacerbates concerns about the supervision commissions’ ultimate lack of accountability to individual targets and under Chinese law generally. Chinese and foreign legal communities criticized the Supervision Law’s initial draft for failing to give suspects — whom the commissions may detain in secret for up to six months (albeit normally with notice to the family or work unit) — the right to consult a lawyer and to subject supervision investigations to China’s criminal procedure law and judicial oversight. In response to public concerns, the Law’s final version contains some procedural improvements. Moreover, the Law does establish procedures intended to restrain improper behavior and abusive treatment of suspects by supervision personnel. It also imposes confidentiality obligations, calls for internal reporting of any attempt to interfere with a case, and establishes recusal and conflict-of-interest rules. Nonetheless, individuals under supervision are not entitled to a lawyer or other criminal procedural protections that help prevent abuse during investigation. Nor does it appear that suspects and their families can ensure the Supervision Law’s own procedural requirements are enforced against the commissions and their personnel. The CCDI has made clear that the Commission is a political body, not an administrative body like its predecessor MOS, nor a judicial organ like the SPC or SPP. This means the supervision system, in addition to being exempted from criminal procedure protections, is also not subject to the extensive body of administrative law that imposes procedural and substantive constraints on government administrative organs, including the police. Under such laws, administrative organs must disclose stipulated information, provide opportunities for the public to participate in rulemaking, and follow due process when imposing administrative penalties. Administrative law importantly also gives the public the right to sue administrative organs over their failure to abide by those requirements or other violation of the public’s lawful rights and interests. The Supervision Law does permit supervision targets to request re-examination of supervision decisions or challenge internally certain unlawful conduct, including prolonged detention. In each case, the final appeal is to the higher-level supervision organ. The Supervision Law does not provide a right of further recourse to the courts, as is available for administrative review decisions. It does, however, require supervision organs and staff to pay compensation “in accordance with law” for infringing a person’s lawful rights and interests. China’s State Compensation Law grants victims of state action a right to compensation bolstered by judicial review. Although that law technically applies to all “state organs,” which include the supervision commissions, it only addresses compensation by administrative and criminal justice-related organs. Thus, the compensation law must be revised before it can be invoked against the supervision organs. The Supervision Law additionally calls for external oversight of supervision commissions by people’s congresses and by the public. Since the commissions supervise these congresses, it is not clear how effective congressional oversight will be. The Law mandates public notice of serious cases filed within the supervision system and requires supervision organs to publish information on their work “in accordance with the law” to facilitate public oversight. The CCP has adopted its own transparency rules, which apply to the CCDI, but the public cannot enforce them. Moreover, the supervision commissions appear not to be subject to the statute on government information disclosure, which applies to administrative agencies and can be enforced through litigation by the impacted public. Thus, it is not clear what “law” will govern these disclosure obligations and enable effective public oversight. Within supervision organs, special internal oversight bodies are tasked with enforcing the Supervision Law’s requirements to ensure a loyal and clean supervision corps. The Law does not specify how this self-supervision mechanism should work. However, the CCDI similarly relies on self-supervision procedures to oversee and correct the actions of its own investigators. The CCDI procedures include a detention system similar to the one outlined in the Supervision Law, providing, for example, that suspected discipline inspectors may not be detained for more than 90 days, or a maximum of 180 days in special circumstances. Moreover, they introduce a kind of checks-and-balances system by assigning supervision over different discipline inspection functions to different divisions. The Supervision Law calls for establishing mechanisms for “mutual coordination and constraint” among commission departments that respectively handle, investigate, and hear various matters. Perhaps this means the National Supervision Commission will adopt similar “separation of power” rules for its own special self-supervision units, as well as for ordinary supervision operations. Regardless, these internal self-supervision systems raise the age-old question: Who will, ultimately, supervise the supervisors? The supervision commissions’ apparent lack of legal accountability under any law other than the Supervision Law also raises concerns over whether the new supervision system might undermine another of Xi Jinping’s signature initiatives: establishing law-based governance. For two decades, the CCP has been promoting legal restraints on the exercise of state power — in part, to counter corruption — through such mechanisms as official transparency, civic participation, and government accountability enforced by more-professional courts. However, the National Supervision Commission appears to be exempted from those restraints. Additionally, the Commission’s questionable accountability regarding the treatment of supervision suspects may impair China’s efforts to obtain international cooperation in extraditing hundreds of corrupt officials living abroad. The United States, Canada, and Australia, where many Chinese fugitives reside, have been reluctant to sign an extradition treaty with China due to concerns over inadequate transparency and due process accorded suspects. In short, the new CCP-led supervision system, with augmented powers over millions of non-CCP individuals, appears to be little different from the extra-legal CCDI system it was supposed to improve. Indeed, at least one death under the new system has been reported. The National Supervision Commission has been accorded a constitutional basis and its own organic law, and it is mandated to obey and help enforce compliance with the Constitution and Chinese law in tackling corruption, but it is answerable only to the CCP. As such, the operation of this new branch of government seems at odds with Xi’s law-based governance ambition. Jamie P. Horsley is Senior Fellow at the Paul Tsai China Center and a Visiting Lecturer in Law at Yale Law School. She is also also a Visiting Fellow at the John L. Thornton China Center at The Brookings Institution.